There are 5 other books in the Hitchhiker's series. Read them all. 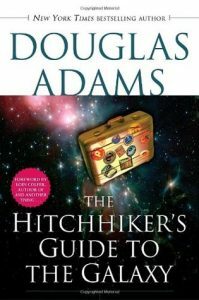 There have been numerous adaptations to Hitchhiker's Guide, including a 1980s television series on BBC, a radio series in 2004, and a blockbuster movie starring Martin Freeman, Mos Def, Sam Rockwell, and Zooey Deschanel. The plot of the 2005 film adaptation differs widely from that of the radio show, book, and television series. If you like the combination of humor, science fiction, and fantasy, check out these laugh-out-loud far-out-there titles. Gork isn't like the other dragons at WarWings Military Academy. He has a gigantic heart, two-inch horns, and an occasional problem with fainting. But he is determined not to let any of this hold him back as he embarks on the most important mission of his life: tonight, on the eve of his high school graduation, he must ask a female dragon to be his queen. The name's Lomax—Alex Lomax. I'm the one and only private eye working the mean streets of New Klondike, the Martian frontier town that sprang up forty years ago. Back on Earth, where anything can be synthesized, the remains of alien life are the most valuable of all collectibles, so shiploads of desperate treasure hunters stampeded here in the Great Martian Fossil Rush. I'm trying to make an honest buck in a dishonest world. But when I uncover clues to solving the decades-old murders of Weingarten and O'Reilly, along with a journal that may lead to their legendary mother lode of Martian fossils, God only knows what I'll dig up. There's something fishy going on in the Unnatural Quarter. Bodies are floating face-down, the plumbing is backing up, and something smells rotten, even to a zombie detective like Dan Shamble. Diving into the slimy underbelly of a diabolical plot, Dan comes face-to-tentacles with an amphibious villain named Ah'Chulhu. With his snap-happy gang of gator-guys Ah'Chulhu wreaks havoc beneath the streets. Dan Shamble is running out of time before the whole stinking city goes down the drain. Ned Henry is a 21st-century historian working on a reconstruction of the hideously ugly Coventry Cathedral, which was destroyed during World War II. Dizzy and confused from a serious case of time lag, he is sent back to the Victorian era to correct a serious mistake made by another historian, who has accidentally bought a 19th-century artifact back to the 21st century. This could alter history and destroy the entire space-time continuum. Unfortunately, Ned, half asleep on his feet, doesn't understand the assignment properly and things go hilariously astray. View more suggestions for The Hitchhiker's Guide to the Galaxy.